This block is so unique! Frisky Vickie Johnson, will guide you through the details of completing your block. The class fee... only $10! Learn paper piecing from the very beginning and build your skills. We'll learn all sorts of tips, tricks and techniques so you can truly enjoy paper piecing and appreciate the advantages of this method of quilt block construction. We'll be using "300 Paper Pieced Quilt Blocks" by Carol Doak as our main resource for patterns. This book comes with a CD drive that enables you to print your own custom pattern templates. Your working sewing machine with bobbins, power cord, foot pedal, owner's manual and any other accessories that may be needed. *A limited number of rotary cutters, mats, ironing pads and irons will be available in the classroom. 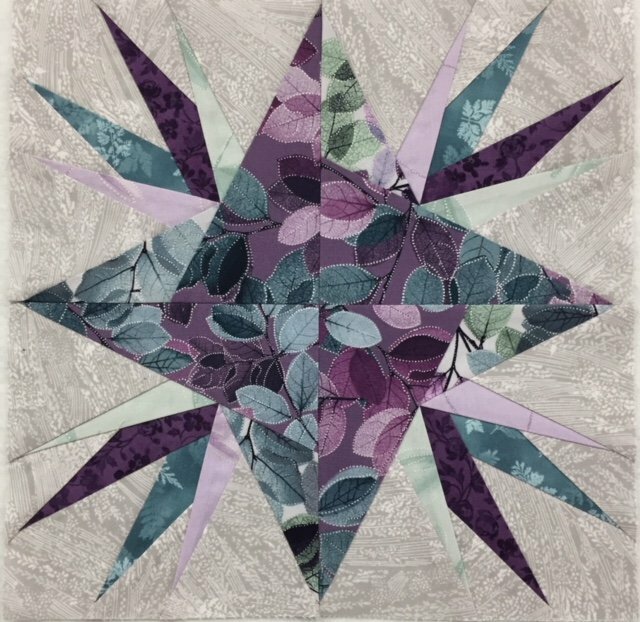 If you wish to join us for the continuing Paper Piecing class series, we will meet on the first Friday of each month from 10 am - 3 pm for a new block or paper piecing project. (This month it's the second Friday as Frisky is on vacation the first week.) This same class session will be repeated on the third Monday of the month from 10 am - 3 pm. Each month, you can choose whichever of the two dates that works best for you. Materials Included: In class you will be provided with your printed paper piecing patterns for stitching, a printed copy of your block pattern to be used as a fabric placement guide, and five hours of step-by-step, detailed, skilled instruction with tips, tricks and maybe even some chocolate!